Willie Spradley with a half rack of his Cajun spareribs. Famous Willie's is going to need to replace their old slogan: "We know we are not 'the best,' but we are the best we know!" Yet even Inlander voters can't sway the innate humility of Famous Willie's owners, Willie and Debbie Spradley. Ask them what makes them great? "Her pies," says Willie without hesitation (he swoons over her buttermilk pie), while his wife, Debbie, says it's the meat that Willie smokes out back of the Post Falls restaurant and the Southern hospitality in their service. Either way, diners can't get enough of the Texas-style barbecue: ribs, pork shoulder, chicken, sausage and their ultra-popular brisket. People love their sides, too, all house-made, from chili beans and corn to coleslaw and baked potatoes. It's not been an easy road, says Willie, who has a way of talking that always sounds like a smile. 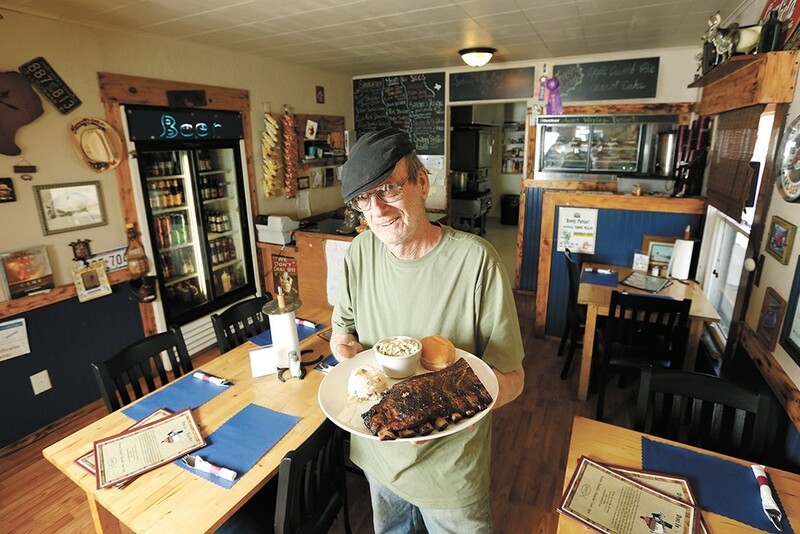 "We almost starved to death the first two years," says Willie, who decided to open a barbecue place in 2010 after moving to the area and realizing that for locals, barbecue meant hot dogs and hamburgers. Now they're packing the cozy place, which is decorated with an eclectic mix of Western memorabilia — a giant set of Texas longhorns, painted sawblades, horseshoes, old signs — and examples of famous people named Willie. A new addition to the place is Cajun food, like crawfish and shrimp étouffée, gumbo and Cajun-smoked meats. Cajun cooking is another facet of his background, says Willie, whose parents taught him to cook and who instilled in him an appreciation for using the whole animal. Barbecue, explains Willie, is from the word barbacoa, meaning nose-to-tail, which is essential to Cajun cooking, which extracts every bit of flavor during the cooking. So even though they call it '"BBQ," say the Spradleys, it's really barbecue. However you spell it, it's plain delicious. Just remember to save room for dessert. The original print version of this article was headlined "North Idaho's Best BBQ"